Autumn is my favorite time of year. I love the cool, crisp air, the beauty of the changing colors, and the smell of burning leaves. And while it is always a busy time of year for me as a professor, the shortening days, the seeming stillness in the air, gives me pause to reflect, to think about the echoes of falls past. When I take time to meditate and breathe, I find myself in awe and wonder at the passing of time itself. When I have a few moments to relax, sometimes I might put on my earphones and listen to a symphony like Brahm’s first, or any number of Bach’s works, or to a fine jazz musician. I find myself wondering at their artistic reflections on time, while I listen to the beats and rhythms, both slow and fast, and watch the shadows grow long as autumn afternoon transitions into eve. Both of the biblical texts we read today are in their own way reflections on time and the human inability to comprehend it. In the Amos passage, the prophet is warning the people of Israel who are looking forward to the “day of the Lord,” envisioning that day as a day of triumph and vindication, likely over their Assyrian enemies. Instead the prophet turns their expectation on its head. The Day of the Lord will not be a day of vindication, but a day of judgment for Israel’s neglect of the poor and the widows and others in their society, while prioritizing expensive shows of flashy worship. In the 1 Thess text, Paul is correcting the Thessalonians misunderstanding about grief and loss. In Paul’s early congregations, people were expecting Christ to return at any moment. Apparently they hadn’t given any thought to what would happen to those who pass away before Christ’s return. They were now concerned about those who passed away, that they had somehow missed their opportunity for seeing the eschaton, that they would be lost forever to the sands of time. This was clearly compounding their grief for their lost loved ones. Paul does not tell them not to grieve. Instead, he comforts them by assuring them in a grief abiding in hope. “Soon,” he tells the Thessalonians, “Christ would return and on that day, the dead in Christ would rise first and those of us who remain would rise up into the heavens to meet them.” For Paul and the Thessalonians, the Day of the Lord meant resurrection and reunion, reunion with lost loved ones, union with the returning savior—and the entire transformation of all creation. You see, both Amos and Paul are correcting our misperceptions of time. Because of our human limitations, we have only an inkling of the true nature of time. Only in the past century, since Einstein, have we become aware that time itself is not a constant, but is relative. For those who travel at high speed, time passes--imperceptibly to all but the most accurate of clocks—a little more slowly in relation to those who are not travelling so quickly. Psychologists also tell us that the human perception of time shifts as we age, as time seems to pass more quickly for those of us who are older, than it does for the youth. Can you remember the times when you as children waited in the wee hours of Christmas morning for time to pass before opening presents? Or can you remember how long time seemed to drag on before the dismissal bell at school? I can see it in the faces of my students when I teach. Fifty minutes seems for them an eternity—and for this aging scholar that time is only the passing of an instant. Of course, one constant that never changes is the allotment of time for a preacher’s sermon. It doesn’t matter how old the congregation member it is, the preacher always preaches too long, am I right? But the Day of the Lord that both these texts refer to, that is another matter altogether. While in the human experience of time, the days may seem to blend together, and one day may seem to be very much like another, there are certain days in which everything, all of history, seems to shift. Many of us can remember that fateful fall morning in September when two airliners crashed in the World Trade Center. For me and my experience, this day today, Nov. 9, also is an important day in history. 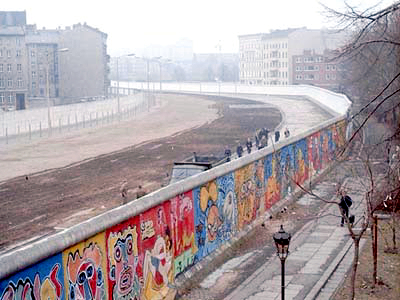 On Nov. 9, 25 years ago, the Berlin wall opened, allowing East Germans to travel freely into West Berlin. With the opening of the Berlin wall, the entire communist block of Eastern Europe unraveled, as nation after nation transformed into capitalistic economies with parliamentary style democracies. It was a transformational day for millions of people in Eastern Europe and as a young college student studying German at the time, I was glued to the television set, watching as the wall came down. I couldn’t wait to get to Berlin and was thrilled the following summer to be present for the day of economic unification, when all the shops in East Berlin transformed overnight, reopening the next day with Western goods in the aisles for the first time and accepting only West German money. I can remember strolling through the aisles of the largest East Berlin department store on Alexanderplatz, eavesdropping on a young couple looking at the jeans and other western apparel. I can remember the young woman saying to her husband, “but I don’t like the jeans; this just is not my style,” and her husband saying in an authoritative voice, “but you have to buy it, dear, that is the now expectation for everyone to wear.” Apparently they hadn’t quite learned that capitalistic consumer mentality of demanding choice. I remember another patron in the store paying for his items and when he received East German coins back as change, he threw them back at the poor cashier. On the day of economic reunification, the banks and shops had only been able to change out the bills, but the Eastern German coinage would remain in circulation for several months, because it took time for new coins to be minted. You see, those fateful days in 1989 and 1990, changed the world in dramatic ways. There is slim chance that I and my wife, who was born and grew up in Czechoslovakia, would never have met, if it had not been for the actions of the one boarder guard at the Berlin wall who in a somewhat impulsive moment of disobeying the orders of his superiors, decided to open the border crossing to the swelling crowds of protestors who had gathered before his gate to West Berlin. Later, in 1992, after finishing college, I went back to East Berlin to live and work among the pastors who had been instrumental in the 10 year ecumenical process of Justice, Peace, and Integrity of Creation to bring about change and renewal in their congregations and communities. You see, this is where I received my real theological training, working with pastors for whom the Amos text we read today meant so much, “Let justice roll down like waters, and righteousness like an everlasting stream.” We all live for those transformational days like Nov. 9th when all of history changes. But such transformational moments are often the product of years of and years of quiet, unseen patient work. The results of such transformational days reflect the character of the slow and steady work in preparing for them. Sometimes they are positive, like in 1989 when the Berlin wall fell. However, many years earlier, in 1938, Nov. 9 represented something darker and far more sinister for Germany, the Kristallnacht, the day the Nazis had been preparing for year, the day that marks the formal beginning of the Holocaust. Individually, we too can all remember important days, when we are baptized, married, when children were born, or when loved ones passed away. But these momentous shifts in time only occur only after periods of preparation. Like Paul’s congregants or Amos’ audience in Israel, we long for these transformational days, without really knowing exactly what they might bring. What both Paul and Amos agree upon is that such transformative days in history belong to God and not us. We as humans are too frail to comprehend the changes such days might bring; and often are quite incapable of coping with their aftermath. Indeed, much of our corporate culture is centered around such “days of the Lord.” Corporations large and small are looking for the next ipad, iphone, or Google, the next “revolutionary” product that will transform stale businesses into competitive, thriving enterprises. Many of them have entire divisions dedicated to research and development, hoping to come up with the “next big thing.” Nonprofits, even small ones like the educational institution in which I serve, have administrators who are looking for breakaway strategies, and transformational donors, people who can come in and make such a substantial gift to the institution that it will stand out from among its peers. Yes, church, I submit to you today, that many of us are looking for that “Day of the Lord.” But let us take Amos’ caution and Paul’s word of comfort to heart. Amos says, “Let Justice Flow down like waters, and righteousness like an everflowing stream.” Our task is to fill the waters, the everflowing stream of time, with moments of purpose in service to God’s justice, this justice that is written in our hearts and that we know is part of the very structure of the universe. Shortly before the verses we read today, Paul tells the Thessalonians to live quietly, mind their own affairs, and to work with their hands—and they will see soon, very soon, the Lord coming together with those loved ones who have passed away. We are reminded that what we do in the day-to-day matters, whether it is giving time to listen to someone who is distraught, or taking time to mentor a disadvantaged child. You see folks, we can’t say when the Day of the Lord is coming. We don’t know when that transformational day might take place; but we can live meaningful lives by minding God’s justice in our day-to-day. 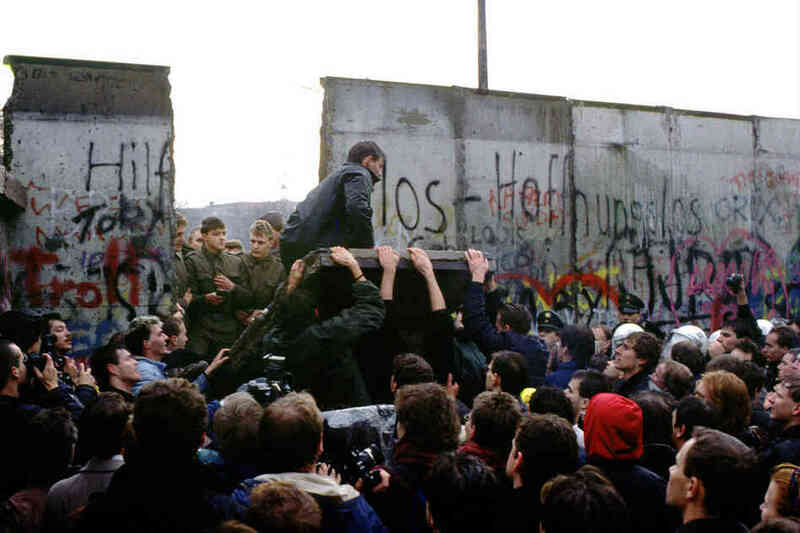 While it is true that the Berlin Wall fell on Nov. 9th, that transformational day was prepared for by pastors throughout East Germany for almost a decade, as they formed small groups dedicated to issues of justice, peace, and ecological vitality. Sometimes those groups were small, as small as this little congregation gathered here, because all of this had to be done under the watchful eye of the East German authorities. But they did it nonetheless, patiently meeting week in and week out, providing in their congregations spaces for open conversation and discussion about God’s justice and how this justice looked so different from their experience behind the iron curtain. 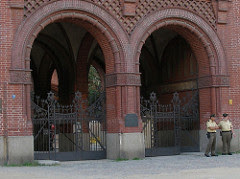 Gradually this movement began to grow, from a handful of pastors and dedicated congregation members, to thousands who would meet in the churches for prayers for peace and justice, light candles and silently, peacefully, march out into the streets of Leipzig, Berlin, and throughout East Germany to protest injustice and pray for peace and justice. You see, real change, God’s authentic change, comes from the margins through daily, quiet, and patient dedication to gentle acts of kindness and fearless dedication to justice and righteousness, all grounded in God’s worship—subsumed in God’s time. I know we all long for the day of the Lord. I am here to proclaim to you that God’s time is our time—and the full dimension of that time are so much beyond our imagination. But if, on an autumn day, you are able to stop and listen for just a moment, perhaps you can hear the heartbeat of God’s Justice, the rhythm of God’s righteous deep in our bones. The day of the Lord is coming. The early Christians opened and ended their worship with the words, “Maranatha,” which means, “Come, Lord, Come.” May the Peace of Christ be with all of you on this, the Day of the Lord.